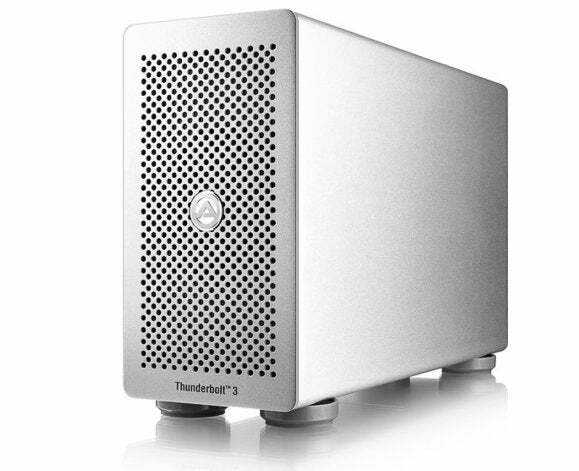 Fantastically fast and fantastically expensive, this external drive lets Thunderbolt 3 strut its stuff to the tune of 2GBps transfers. If you’d walked by our test bed while we were testing Akitio’s Thunder3 PCIe SSD, external drive, you’d probably have stopped and done a double-take. 2GBps transfers from an external drive? No way. How could this possibly be, you ask? The Thunderbolt 3 interface is basically PCIe over a wire, and features a massive 5GBps transfer rate. The Thunder3 PCIe SSD is a classy-looking, Thunderbolt 3 enclosure that contains a single PCIe slot. Put a 1.2GB Intel 750 NVMe SSD in said slot, and for all intents and purposes, it’s the same as putting it in an internal PCIe slot. 2GBps? Thunderbolt 3 isn’t even breaking a sweat. Alas, this marvelous demonstration of advanced technology isn’t cheap. Actually, at $1,299, which includes the $800-plus drive (or even $1,270 on Amazon), it’s not even within shouting distance of affordable. But dang, if its speed isn’t enticing. The silver-hued Thunder3 PCIe SSD measures approximately 9.2 inches deep, by 6 inches tall, by 3 inches wide. That’s large, but necessary to accommodate all types of PCIe cards, including full-height and double-width if necessary. In this case, the card is the single-width, low-profile Intel 750, which means more room for airflow to keep it cool. The back of the drive sports two Thunderbolt 3 ports, as well as what the online specs say is a single DisplayPort 1.1 port. 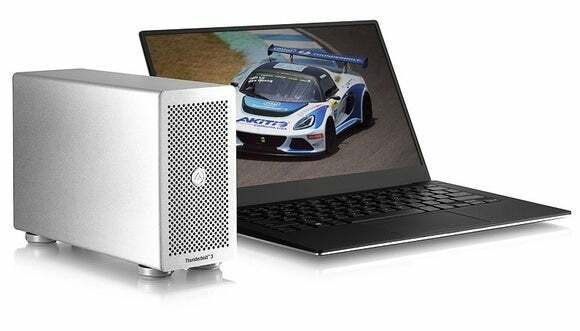 The Thunderbolt 3 chip is an Intel Alpine Ridge, which supports DisplayPort 1.2, but Akitio informed us that there have been issues with some 1.2 displays, so it's sticking with DP 1.1. Note that Thunderbolt 3 uses the same Type-C connector as USB 3.x, but requires a more expensive cable with embedded electronics. A Thunderbolt 3 cable is included with the drive. And no, the Thunder3 PCIe SSD won’t work with USB 3.1. 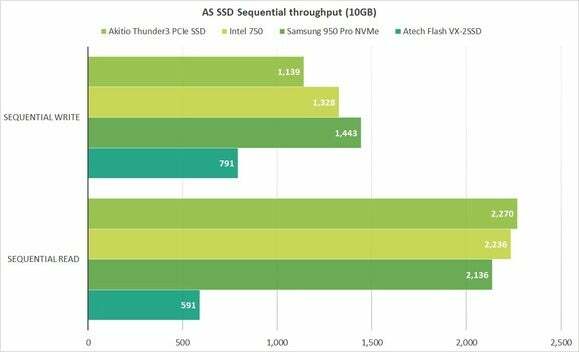 If your laptop features Thunderbolt 3, it’s quite possible that the Thunder3 PCIe SSD will be multiple times faster than your internal storage. Our test box came pre-populated with the Intel 750 SSD, but captive thumbscrews on the back make opening the unit and adding your own PCIe card SSD a snap. 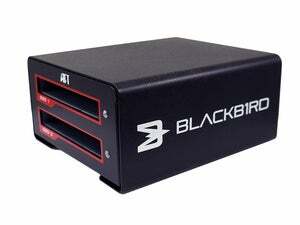 So yes, you can pay $400 for the box and roll your own adapter card/M.2 PCIe solution. We’ve already told you that the Thunder3 PCIe SSD is really, really fast, but there’s nothing like a chart or two to drive home that point. We’ve included internally mounted Samsung 950 Pro M.2 NVMe and Intel 750 SSDs to illustrate the relatively even performance between internal and external PCIe. 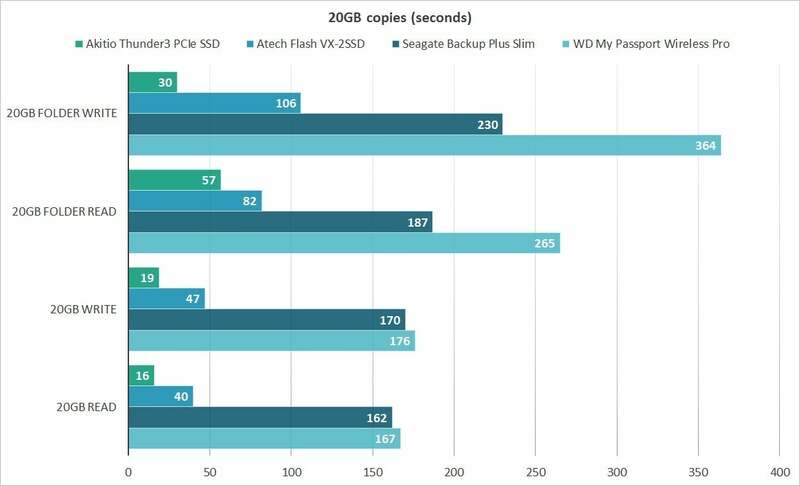 The Akitio Thunder3 PCIe SSD at the end of a Thunderbolt 3 cable actually outperformed two internal NVMe drives in pure sequential read speed. The Atech Flash VX-2SSD, a very fast external USB 3.1/SATA RAID enclosure that would dominate most external drive graphs, seems slothful by comparison. Though not shown, random access times are in line with an internal NVMe SSD as well—0.03 to 0.06 milliseconds. As shown below, the Thunder3 PCIe SSD’s performance simply squashes that of other external drives. Especially plain USB 3.0 hard drives such as the Seagate Backup Plus Slim and WD My Passport Wireless Pro. 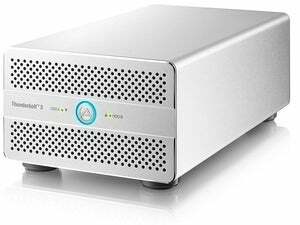 Then again, the Akitio drive costs nearly 30 times more than a plain 2TB USB 3.0 drive. Ouch. There’s simply no comparison between the Akitio Thunder3 PCIe SSD and normal USB storage in terms of raw throughput. We used an Asus X99 Deluxe motherboard with an Asus Thunderex 3 expansion card attached to its Thunderbolt header for testing. Note that the Thunder3 PCIe SSD is not compatible with OS X, and you can’t boot from it. The Akitio Thunder3 PCIe SSD is a great product, and a joy to use. But, of course, we didn’t have to pay for it. The nearly $1,300 price tag pretty much relegates the pre-populated version to deep-pocketed early adopters and speed freaks, or multimedia production types in a hurry. Even $400 for the enclosure is sure to make the average user blanch. I, and I suspect the majority of the public, will make do with those $80 2TB, 130MBps USB 3.0 drives for a bit longer. Sigh. This blazingly fast external Thunderbolt 3 drive earns four stars despite its whopping $1,300 price tag. If the cost doesn't faze you, the 2GBps transfer rates will amaze, not to mention save you scads of time.